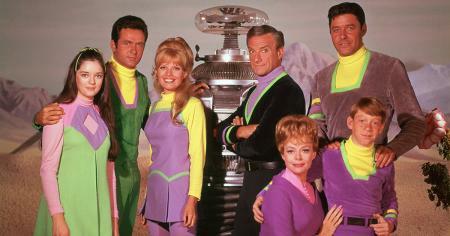 Lost in Space premiered on September 15, 1965. 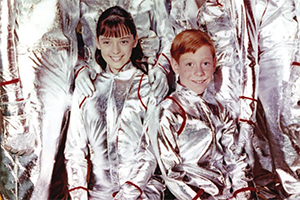 Like many other series of the mid-'60s, Lost in Space mutated throughout its brief run, as the show adapted to the quickly shifting landscape of television. 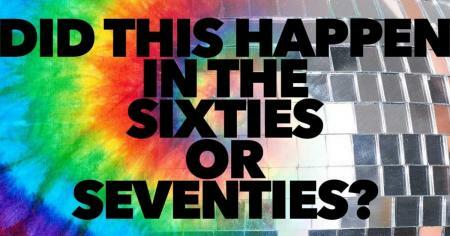 It was, in essence, three different shows over its three seasons. That's part of what makes it so enduringly fascinating. 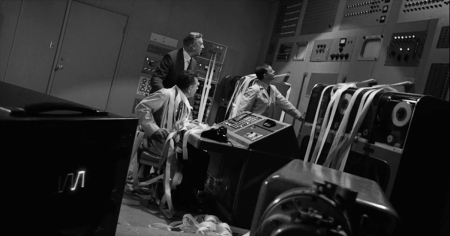 In its first year a black-and-white sci-fi adventure, the show become far more colorful in season two, both in cinematography and tone. Up against Batman on the schedule, Lost in Space went camp. In the third and final season, the Robinson family and crew get off the planet and set off into increasingly creative and downright bizarre, er, star treks. Here are things you might not know about the series. John Williams composed the theme song. He was known as Johnny Williams at the time, then 33 years old. The budding composer penned scores for four of the first seven episodes. 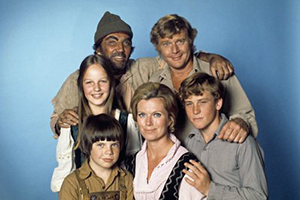 Before season two, a new theme song was composed by Warren Barker, a television vet who mostly filled sitcoms like Bewitched and That Girl with music. It was wisely scrapped and Williams' work remained. For the third season, Williams reworked the fanfare, adding a little more punch. In the Lost in Space theme, you can hear many of the composer's trademark techniques that would become legend in Star Wars and countless Spielberg films. Actually, it sounds a bit like a sped-up take on the Jurassic Park theme. It was a comic book adaptation. Some bemoan the glut of comic book adaptations in Hollywood these days, but the practice is hardly new. 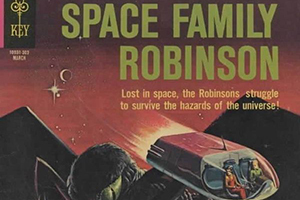 In 1962, Gold Key Comics, which became better known for its TV adaptations, launched Space Family Robinson, a modernization of The Swiss Family Robinson. After some back and forth over rights issues, the studios reached a deal with Gold Key, which would be allowed to change the name of its comic to Lost in Space. 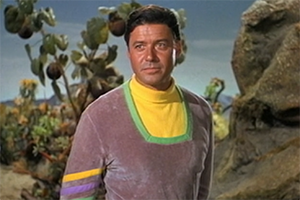 Series creator Irwin Allen was no stranger to fantastic adventure, having first set forth on his Voyage to the Bottom of the Sea in 1961. Nearly 10 years later to the day after the premiere of Lost in Space, on September 14, 1975, Allen returned with this more faithful adaptation of the popular children's novel. Martin Milner of Route 66 and Adam-12 starred, with Willie Aames and Helen Hunt as the kids. The series was big on recycling. 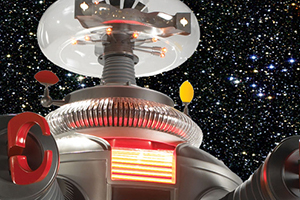 Lost in Space cleverly repurposed props and effects shots to cut down costs. 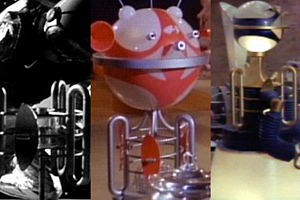 As you can see in the picture, the long range scanner of the Jupiter 2, shown in "The Derelict" from season one, was repurposed for "female" robots in "The Ghost Planet" and "Deadliest of the Species." A little paint and glue goes a long way. The set of the Jupiter 2 cost more than that of the Enterprise. Sure, the producers recycled, but they were not cheap. The set of the Robinsons' craft ran a bill of $350,000 — about $2.5 million in today's bucks. Not too bad, really. In the story of the show, the nifty flying saucer supposedly cost $30 billion. Those were real computers in the Jupiter 2. 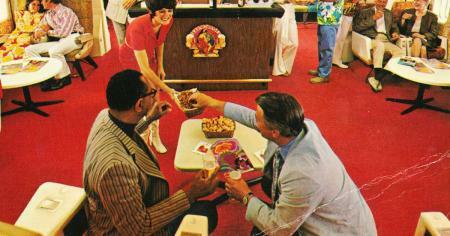 Though its iconic computer appeared in numerous sci-fi settings, Burroughs was a real company, a manufacturer of business machines in St. Louis. The B205 was a large box with an array of twinkling bulbs and three knobs across the bottom, visually akin to an early synthesizer. Three of them sat at the controls of the Jupiter 2. 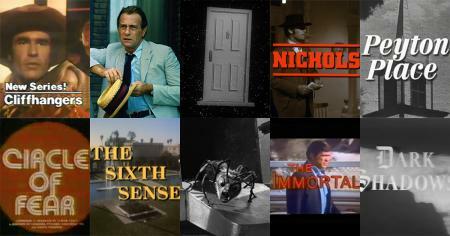 Irwin Allen plopped the machine into more of his shows, and a Burroughs could often be seen in the Batcave. There is an obscure link between the Lost in Space universe and the Star Trek universe. Here are some other fun facts about Jupiter 2. Its hull is constructed of titanium (real) and cosmium (not real). It is said early on that the ship's trip to Alpha Centauri would take 5.5 years, meaning it travels at about 79% the speed of light. How does it achieve such speed? It's fuel, deutronium (not real). The sci-fi element is also the primary resource of the planet Lazon II in the Star Trek universe, as mentioned in the Star Trek: The Next Generation novel Triangle: Imzadi II. Hey, it's a stretch, but it opens the possibility for a Spock / Dr. Smith crossover. 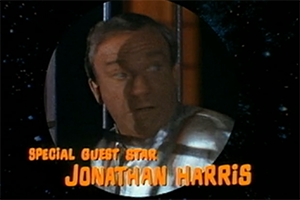 Jonathan Harris was always listed as "Special Guest Star." Speaking of the not-so-good doctor, actor Jonathan Harris, who became the focus of the show as it grew more comedic, was forever billed as a special guest star in the credits. It won an award for costume design. In 1968, designer Paul Zastupnevich, a frequent collaborator with Irwin Allen, won the Costume Designers Guild Award for "Best Dressed TV Series." In the first season, Zastupnevich used a heavy silver fabric for the shiny space suits, the same material used in fire suits. It was later swapped for a lighter, brighter, more pliable material. The Robot costume weighed about 200 pounds and cost $70,000. That's around half a million in today's cash. The robot was designed by Robert Kinoshita, who also designed the iconic Robby the Robot and Tobor. 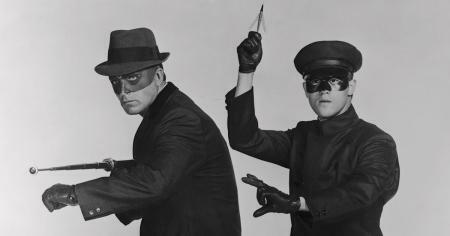 In 1965, stuntman Bob May was rehearsing on a studio lot, working as a double for Red Buttons, when Irwin Allen spotted the physically gifted performer. 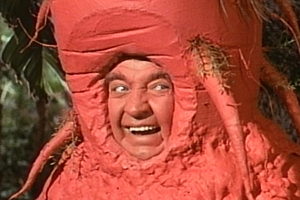 Allen told May that if he could fit into the costume, the role of Robot B-9 was his on Lost in Space. Fortunately, May fit inside the fiberglass suit. In the earlier designs, May would have had to trigger the lights on the Robot's torso by hitting a button inside the suit with his head. The button was eventually moved down by the claw. There was a talking carrot — and nearly a purple llama. Perhaps no Lost in Space episode is more notorious than "The Great Vegetable Rebellion," the penultimate outing of the series. Screenwriter Peter Packer was so unsure of his script that he reportedly hid it behind his back when presenting it to Harris. 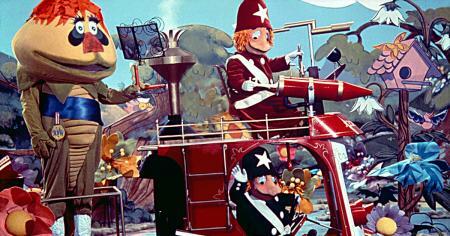 Our heroes are turned into plants by a giant sentient carrot (that's him in the picture, obviously). The script also called for a llama named Willoughby. The animal did not get along with Harris and kept spitting, and thus was cut. However, veteran character actor James Millhollin was listed as Willhoughby the Llama in the closing credits. Alas, Lost in Space only lasted one more episode. The Jupiter 2 launched on October 16, 1997. Or maybe October 20. 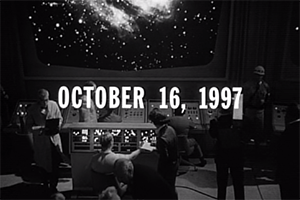 Do you remember what you were doing on October 20, 1997? Not witnessing the launch of a flying saucer to Alpha Centauri, sadly. Yet in the real world, the date marked a minor advancement in space exploration. Two Russian Mir cosmonauts completed the first "internal spacewalk" when they wore suits inside the airless Spektr module for a repair. A few days earlier, NASA launched its robotic Cassini spacecraft on its mission to Saturn. While it did not have a voice like Robot B-9, it only cost $3 billion. Anyway, we digress… There is some interesting controversy over the fictional launch date of the Jupiter 2. 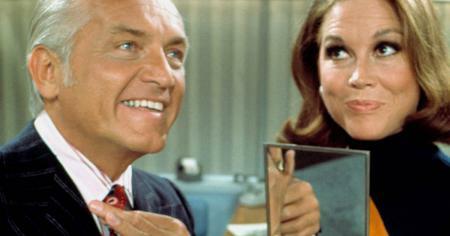 At the start of the original pilot, "No Place to Hide," the date is printed on the screen, seen here. However, this episode was not aired until 1997 itself. Here's where it gets more confusing. In the second aired episode, "The Derelict," John Robinson is seen writing this in his journal: "October 21 in the Earth year 1997. Somewhere in space. We've come to the end of the first 24 hours of the voyage." The scripts of the early episodes refer to October 20 as being the launch date. This can be seen earlier in that same episode, when a newscaster gives an update after launch at "October 21, 1997, 18:00 hours."